Until I read J. R. R. Tolkien’s The Lord of The Rings, my favorite book growing up was, by far, The Hobbit. Growing up in Russia, however, meant that instead of Tolkien's English version, my parents read me a Russian translation. To me, the translation easily matched the pace and wonder of Tolkien's original. Looking back, The Hobbit probably made such an indelible impression on me because Tolkien's tale was altogether different than the Russian fairy tales and children’s stories that I had previously been exposed to. There were no childish hijinks, no young protagonists, no parents to rescue you when you got into trouble. I considered it an epic in the truest literary sense. As with many Russian translations during the Cold War, the book came with a completely different set of illustrations. Mine, I remember regretting slightly, lacked pictures altogether. A friend’s edition, however, was illustrated in the typical Russian style: much more traditionally stylized than Tolkien’s own drawings, they were more angular, friendlier, almost cartoonish. In this post, we include a number of these images from the 1976 printing. The cover, above, depicts a grinning Bilbo Baggins holding a gem. Below, Gandalf, an ostensibly harmless soul, pays Bilbo a visit. Next, we have the three trolls, arguing about their various eating arrangements, with Bilbo hiding to the side. Here, Gollum, née Smeagol, paddles his raft in the depths of the mountains. Finally, here’s Bilbo, fulfilling his role as a burglar in Smaug’s lair. 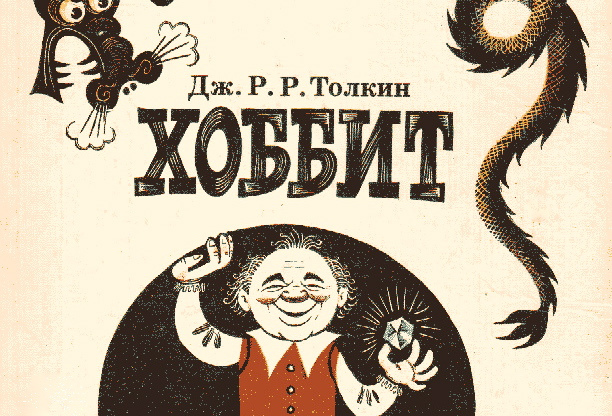 For more of the Soviet illustrations of The Hobbit, head on over to Retronaut. For another Soviet take on The Hobbit, watch this 1985 TV adaptation. Say what you like, that’s quite a Gollum. Just curious, anyone know what Facebook page highlighted our post today? Thanks for any info. Hope this helps! Otherwise, thank you so much for the article, a fascinating read! Nice, thanks for letting me know! Thank you for sharing these memories, and the link to the Retronaut page http://bit.ly/1gxRoth … the final picture on that page looks like something from the Bayeux Tapestry! The Hobbit was also my first and still my favourite Tolkien book. Now those are some interesting looking illustration. Bilbo apparently doesn’t need pants with those hairy legs, haha. And got here from a Tumblr post. Just in case anyone is interested, my grandfather illustrated this book. His name is Mikhail Belomlinsky. He illustrated countless soviet era children’s books until immigrating to New York City in 1989. Also, it may be of interest to your readers that this edition of the Hobbit, with these exact illustrations has recently been republished in Russia. Thank you again for posting this. Soviet Union’s Raduga publications, Progress press and Mir publications did the service of bringing good literature, science and politics to millions of not so rich people around the world. I am from Tamil Nadu, a southern state in India. But till 1995 (yes, even after the collapse of USSR), Soviet printed books were sold for a very cheap price in India. They even sold Tamil translations of many books. Till now, I have at least 300+ Soviet books in my collection. Compare this to USA or UK (who looted India through Imperialism)! They contribute nothing for us while they bring in their stupid laws to cripple our education and learning. One thing the world needs badly now is Communism.